Funny how good the "every bit local"caprese-style salad looked after the long months without fresh local tomatoes. 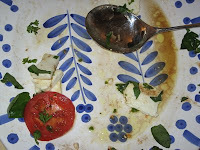 The big platter of Bleugrass Chevre goat cheese/Roland Macintosh hydroponic tomato/homegrown herbs/vinaigrette may have lasted three minutes - and then the beautiful pattern on the platter underneath got to show itself off. A lovely large crowd of people brought a record-setting number of young people with them, many of whom ended up moist (that's a euphemism) from (parentally approved) play in outdoor puddles, romps through the back yard, climbs on the mulch pile, and other adventures. Quite a few people new to the Cornbread Suppers appeared this week, with and without children. Chili with beef + beans + ?? Rice Pudding with Cinnamon - enjoy!